(New York, 7 July 2017) On 7 July 2017, Religions for Peace (RfP) joined more than 120 UN member states, parliamentarians, mayors, and civil society organizations in celebrating the adoption of a legally binding treaty to prohibit nuclear weapons, leading towards their total elimination. The preamble of the new treaty highlights the role of religious leaders in raising public conscience on the principles of humanity. 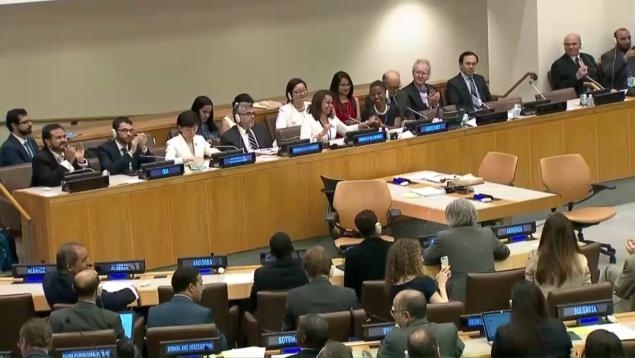 (New York, 7 July 2017) On 7 July 2017, Religions for Peace (RfP) joined more than 120 UN member states, parliamentarians, mayors, and civil society organizations in celebrating the adoption of a legally binding treaty to prohibit nuclear weapons, leading towards their total elimination (read the treaty document here). The preamble of the new treaty highlights the role of religious leaders in raising public conscience on the principles of humanity. Religions for Peace finds strength in its opposition to nuclear weapons through its strategic, action-oriented, multi-stakeholder partnership among religious leaders, parliamentarians and mayors. In Augst 2015, this partnership–Religions for Peace, Parliamentarians for Nuclear Non-Proliferation and Disarmament, and Mayors for Peace–produced a joint statement called A Nuclear-Weapon-Free World: Our Common Good to commemorate the 70th anniversary of the nuclear bombing of Hiroshima and Nagasaki. The joint statement called on world leaders to commit to nuclear abolition and declare the importance of advocacy by religious leaders, parliamentarians, and mayors specifically in this critical issue. A joint statement by religious leaders, parliamentarians and mayors was presented to the United Nations Under Secretary General for Disarmament Affairs on 30 June 2017. 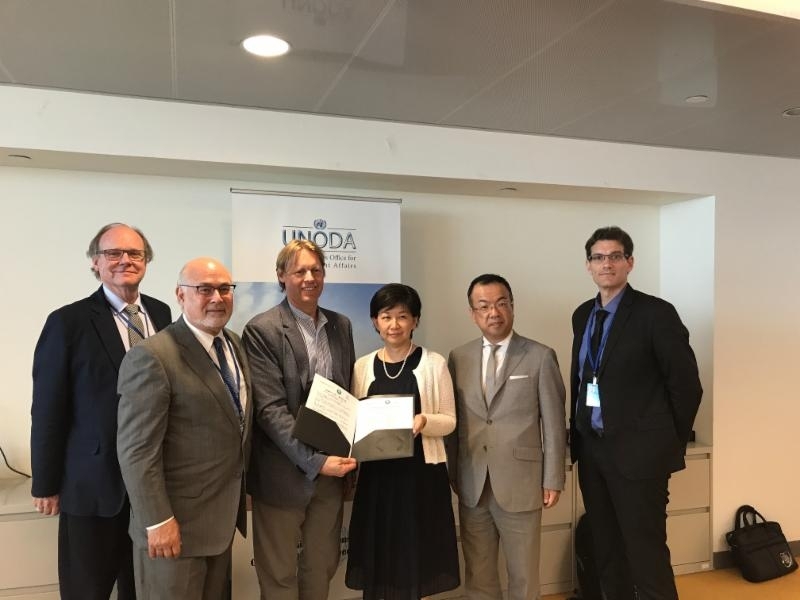 From left to right: Mr. Randy Rydell, Senior Advisor, Mayors for Peace; Mr Jonathan Granoff, President, Global Security Institute; Mr. Alyn Ware, Global Coordinator, Parliamentarians for Nuclear Non-Proliferation and Disarmament; Ms. Izumi Nakamitsu, Under Secretary-General of Disarmament Affairs; Rev. Kyoichi Sugino, Deputy Secretary General, Religions for Peace; and Mr. Jean-Marie Collin, Director, PNND France. As for the importance of youth in disarmament, the Religions for Peace Arms Down! Campaign–the fist global, youth-led, multifaith campaign advancing disarmament–collected 21 million signatures for its petition focusing on redirecting military spending to funding the (then-MDGS, and now) SDGs. 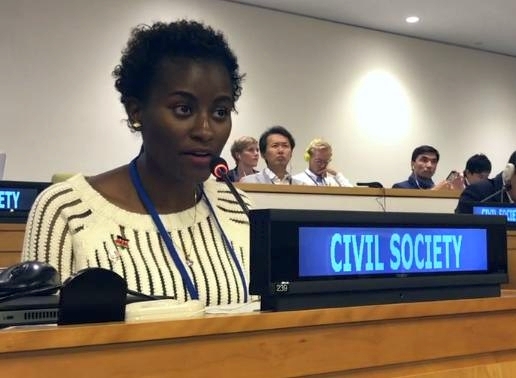 The effort is continuing with Religions for Peace Global Interfaith Youth Network members such as Ms. Linnet Ngauy (pictured left), representing the African Council of Religious Leaders-Religions for Peace, taking leadership and offering support for ICAN. Religions for Peace plans to build upon the adoption of today’s nuclear ban treaty and continue momentum by mobilizing and engaging our networks at all levels–from senior religious leaders to the most-grassroots level, working towards the abolition of nuclear weapons. Religions for Peace advocates for signing and ratification of the treaty. It will be open for signature on 20 September 2017 during the General Assembly. The treaty will formally enter into force 90 days after it has been ratified by 50 states. RfP anticipates participation in the 2018 High-Level Conference on Disarmament. Founding members of RfP previously spoke at three UN Special Sessions for Disarmament in 1978, 1982, and 1988. By strengthening collaboration in new and existing partnerships and by creating new confidence and dialogue among countries, RfP believes this is the time to completely eliminate nuclear weapons.